What is High Point Fleet GPS Tracking? High Point Fleet GPS Tracking is a robust and extensive GPS tracking solution, providing fleet managers, drivers, and maintenance personnel with a comprehensive platform that enables them to monitor their vehicle’s location in real-time and records their truck activities and progress then displays their breadcrumb trail on a web portal. On top of that, the system records and analyzes driver behavior to determine if he is performing on a level that maximized fuel and truck efficiency while at the same time, complying traffic rules and regulations. High Point Fleet GPS Tracking makes dispatching and messaging between drivers and dispatchers. Dispatchers can easily send efficient routes to drivers in the field via their mobile devices or their Garmin GPS set. Aside from routes, dispatchers can assign stops, deliver messages and updates, and receive real-time notifications of their drivers’ progress. 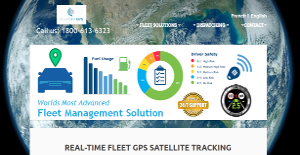 High Point Fleet GPS Tracking is an online platform created to enable companies to manage fleet vehicles on the field in actual time. The software offers real-time GPS tracking capabilities, readily providing you the exact location of your trucks, trailers, and containers. An advanced tracking device in installed in each vehicle, which is on constant connected with cellular networks and satellite systems. This tracking device delivers real time vehicle location updates, giving fleet managers the real-time location of their vehicles. High Point Fleet GPS Tracking comes with the Route Manager functionality that enables users to readily see actual vehicle locations. You can also personalize vehicles by type, usage type, color, etc. to easily distinguish them on the map. Dispatchers will definitely love High Point Fleet GPS Tracking’s dispatching feature. This capability makes it quick and easy for dispatchers to locate an address, find the nearest fleet asset to a meet-up location, and transmit the location and other information to the driver. All of these details will be seen on the device of all concerned drivers at the same time as a benefit of the app’s two-way messaging feature. In effect, using High Point Fleet GPS Tracking’s dispatch functionality virtually removes the inevitable delays inherent in SMS messaging. Fleet assets can access this feature in any communication gadgets that drivers use such as tablets and mobile. Its truck routing feature also gives directions to ensure that vehicles never get off-track. What Problems Will High Point Fleet GPS Tracking Solve? Fleet Managers equipped with this knowledge can more easily identify the drivers, vehicles, and locations that exceed acceptable levels of idling and take corrective action. Reducing unnecessary idling is a simple way to reduce fuel costs. Set up regular maintenance reminders: When Fleet Managers act on this information, they can more efficiently manage vehicle maintenance and identify vehicle issues before they become major repairs. This can help reduce major repair costs and vehicle downtime which is an integral part to all operations. In addition, regular maintenance on vehicles can potentially prolong the life of major vehicle parts as well as increase the longevity of a vehicle. Knowing the utilization of vehicles and gaining insight into the routes taken each day can help management recognize where changes are needed to improve the efficiency of the fleet and avoid unnecessary miles driven. Having access to such valuable information can help Fleet Managers make more informed decisions on new vehicle purchases. For example, vehicles identified as not in use can be re-assigned to locations that require additional vehicles, thus sometimes eliminating the need to make unnecessary big purchases. If you are considering High Point Fleet GPS Tracking it might also be beneficial to analyze other subcategories of Best HR Software collected in our base of B2B software reviews. Every enterprise is different, and might require a special HR Software solution that will be adjusted to their company size, type of clients and staff and even specific industry they deal with. You should not count on locating an ideal services that is going to be suitable for every business no matter what their history is. It may be a good idea to read a few High Point Fleet GPS Tracking reviews first and even then you should remember what the service is supposed to do for your company and your workers. Do you require a simple and straightforward app with just elementary functions? Will you really use the advanced tools needed by experts and big enterprises? Are there any specific tools that are especially beneficial for the industry you work in? If you ask yourself these questions it will be much easier to get a trustworthy service that will fit your budget. How Much Does High Point Fleet GPS Tracking Cost? We realize that when you make a decision to buy HR Software it’s important not only to see how experts evaluate it in their reviews, but also to find out if the real people and companies that buy it are actually satisfied with the product. That’s why we’ve created our behavior-based Customer Satisfaction Algorithm™ that gathers customer reviews, comments and High Point Fleet GPS Tracking reviews across a wide range of social media sites. The data is then presented in an easy to digest form showing how many people had positive and negative experience with High Point Fleet GPS Tracking. With that information at hand you should be equipped to make an informed buying decision that you won’t regret. What are High Point Fleet GPS Tracking pricing details? What integrations are available for High Point Fleet GPS Tracking? If you need more information about High Point Fleet GPS Tracking or you simply have a question let us know what you need and we’ll forward your request directly to the vendor.